What's to Gain from Pain? Have you ever wondered what it'd be like to be impervious to pain? As a martial artist, it'd certainly have its perks. It's the sort of superhuman power that belongs in comic books. Amazingly for some people it is a reality. Congenital Insensitivity to Pain with Anhidrosis CIPA is a rare condition in which children are born without the ability to sense pain or extremes in temperature. They are normal in every other sense. They can still feel other sensations and touch from normal body-to-body contact. But these people simply can't feel pain and never will. They can hurt themselves in all ways imaginable and may not even know it. And while this might all sound great, I'd think twice before wishing for this kind of 'invincibility'. Children born with CIPA have no protective reflexes and as a result, they don't learn to protect their bodies from injury. Fractures, dislocations and joint injuries are a common occurance, and in some cases children have been know to accidently chew through their own tongues, or poke their eyes out. Many fail to even live past their 20s. If the reality of this situation teaches us anything, it's that pain is clearly important. And, without our body's alarm system, we'd be in serious trouble. In martial arts a lot of what we do is also about learning how to dampen, even ignore that little voice. We're all familiar with sayings like "no pain no gain" and "a little pain never hurts" - the take home message: no one likes a wuss and if you're tough you can take it. "Pain is the best instructor, but no one wants to go to his classes"
If this were true I wonder what Pain really would have to teach us? After all, if learning to ignore pain is good, to what extent should we refuse to listen to that little voice? Pushing through pain might earn one respect inside the dojo, but there are clearly times where this could be quite dangerous. And, if training is about self-defense and self-preservation, shouldn't we also be trying to look after our bodies? In learning to protect ourselves, how does constantly (and sometimes even permanently) injuring ourselves make any sense? I don't really have any answers to these questions. All I can think is that maybe the idea of pain endurance is a question of intensity – a scale running from mild discomfort to crying like a baby. Or perhaps it's about good and bad 'kinds' of pain – qualitatively different voices we should listen to. In either case, if we're going to ignore some kinds of pain and not others, how do we tell the difference between the two? And, does 'pain tolerance' really make any sense at all if you only prepare yourself for certain kinds? From a neurological perspective, there is one rather drastic treatment for patients suffering from chronic pain disorders. And in these cases the objective is not preventing them from feeling pain but rather to changing the way they think about it. A Bilateral Cingulotomy is a form of psychosurgery and a last resort for patients suffering from chronic pain. The surgery involves making lesions to a part of the brain which is responsible for integrating feeling and emotion with the pain response. After surgery, these patients typically still feel pain but without the normal emotional reaction to it – in other words, they're simply no longer bothered by it. 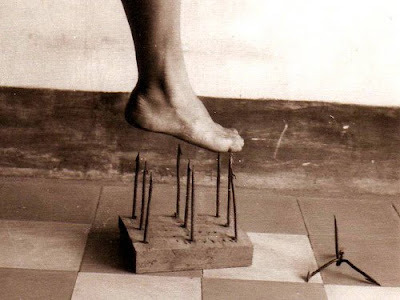 Maybe this is the kind of relationship with pain we should be aiming for – to treat pain as a guiding voice, rather than one we simply obey or ignore. Rather than sticking our fingers in our ears when we hear it nagging, perhaps we should be trying to learn its language so we can listen objectively to what it has to say. I can't say that I really like those conversations. I guess for the most part, that little voice has my best interests at heart and for that at least I should be grateful. Still, there are a lot of cases where pain doesn't really make much sense and at least in that regard it can be a difficult language to understand. I'd be really interested in other people's views on the topic – what lessons can be learnt through pain, and in cultivating mental toughness? When and to what extent should we listen when its got something to say? I'm frequently told that we should aim for moderation in all things but when I look to those exceptional people – the people I find truly inspiring – moderation isn't exactly something they have in spades. To be honest, it's never been my strong suit either (and maybe its something in the genes). But, I wonder if martial arts addiction (compulsive training, obsession with details etc) is by definition unhealthy? A friend in Naha would frequently call me and the other students of the honbu dojo crazy karate-kaholics. He found the amount of training we did down-right ridiculous and I can appreciate his point of view. In our club we sometime talk about the “martial arts-bug”– like it's a kind of virus from which there is no known cure. it must be undertaken several times a week until you reach "the PA state". I'm not sure whether my relationship with martial arts would meet the criteria for "positive addiction" but it's nice to know I'm not alone in my obsessions. 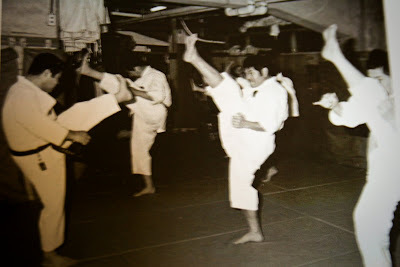 Other instructors (who can remain anonymous for now) have confided that they've on occasion, used gym equipment for fore-arm conditioning, practiced footwork in the isle of grocery stores, sanchin kata in the toilet on lunch breaks and even in the isle of planes at night when no-one's looking. Whatever the case may be, martial arts addiction certainly seem to bring out the child in some of us. I suppose at the end of the day, moderation in life is nice, but maybe there should also be moderation in moderation – an excuse to reserve some obsessive behaviour for those occasional passionate pursuits. "Do not try and cut off all your passions. Passions give birth to heroic activity. Fulfill your passions and that will bring bliss". Well, it's been a little quiet around here of late and one of my recent commentors pointed out that “writing is a discipline too" and one that “shouldn’t be neglected”. This is true. But, when life gets busy I think we sometimes have to choose between training and writing and for me training tends to come out on top. The comment did make me stop and think though about 'staying power' and what it is that enables us to stick to the things we set out to do. 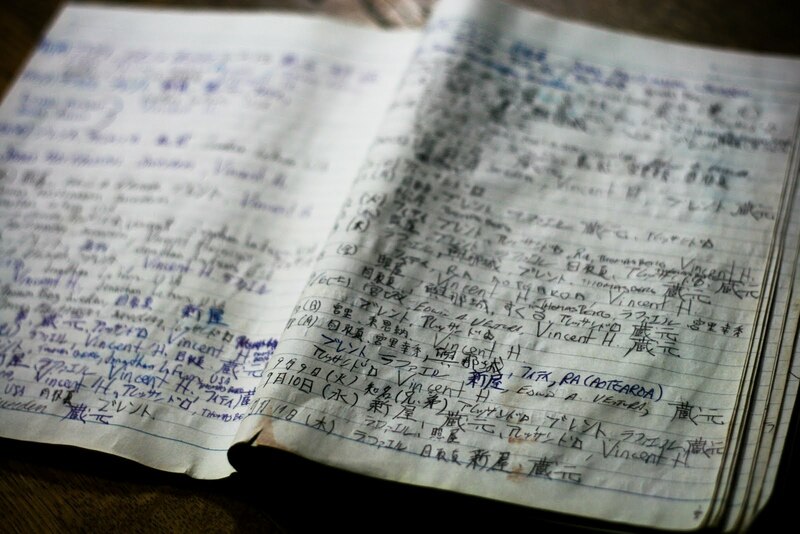 In Naha we had a dojo diary – a daily training log where students would record their names. "Dojo history" as Sensei calls it. This little book did have a funny way of talking to me. On the odd occasion when I'd miss a session, the blank line would have a peculiar way of making me feel guilty. But for the most part, the book and I were on good terms. Sometimes I'd flip through the pages examining the handwriting and names – the ink sometimes smeared from dripping foreheads and sweaty hands. I wonder how many hours of training that book has seen? Malcom Gladwell in his book 'Outliers: The Story of Success' talks about the 10,000 hour rule as one of the secrets of greatness. It's no surprise that mastery requires an enormous amount of time and practice. But, according to Gladwell, this may be even more important than natural talent. True mastery and success may be as simple as applying yourself to practice 20hrs a week for a period of 10 years. I wonder though if sheer quantity of practice is really enough? Surely, the people who are able to undertake that degree of practice exhibit other qualities – not least, a love and passion for what they do that ensures their practice is motivated and meaningful. In the context of martial arts, it's just too easy to 'tune out' and go through the motions. I find it hard to believe 10,000 hours of 'poor practice' is really all it takes. After all, mistakes patterned in are all the harder to erase. Regularity and quantity of training is clearly important but the quality of training must be there too. Maybe as Randy Borum points out, it's "perfect practice that makes perfect" - 10,000 of deliberate, focused and systematic attention to training and a willingness to persist even when it's not fun. And, I wonder if this isn't what Sensei's getting at with the dojo diary – a personal record of our own hours and a challenge to ourselves to make each hour of our practice 'perfect'. length should be approximately the same as the distance from the ground to the knee joint. 5. 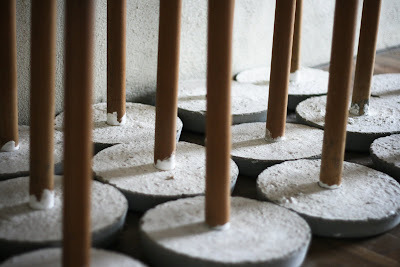 Put your chiishi handle in the bucket and gradually pack the cement mixture in. Aim for an even distribution. It's important to get the handle straight in the very center of the bucket and for the mix to be spread evenly (lop-sided chiishi are harder to work with). 6. Once you're happy with the position and mix is even, smooth it out and let it set (leaving it for at least 24-48hrs is probably a good idea). 7. And voila, pop it out of the bucket and you've got a shiny new chiishi to play with. Just be kind to it for the first month since it can take this long for it to fully dry and harden. The chiishi (pictured above) is one of my favourite hojo undo training tools. 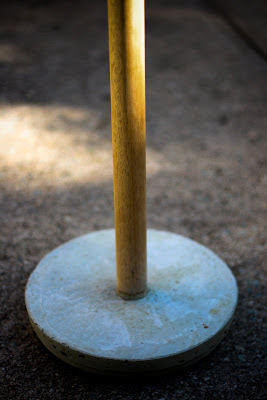 It may not look like much, but don't let that fool you - you can do more with this little cement stick than half a dozen pieces of training equipment at the gym. Like many of the hojo undo and kata of Goju Ryu, the chiishi is believed to have originated from China. It's said that Kanryo Higaonna Sensei (the founding father of modern-day karate) practiced daily with the chiishi and other hojo undo implements during his 14 years of martial arts study in Fuzhou, before returning to Okinawa. Today, the chiishi has become a relatively common training aid in Okinawa and in the honbu dojo we'd usually train with the chiishi as part of our general hojo undo sessions at least 2 - 3 times a week. As with all hojo undo, the chiishi has a standard series of techniques to work through (the chiishi kata), as well as an infinite number of variations. On average the exercises take approximately 15-20 minutes, however with variations you could easily spend hours working through techniques. The chiishi is generally described as a tool for conditioning and strengthening the wrists and arms but it's also excellent for training blocking and striking techniques as well as the importance of synchronizing breathing with whole-body power. We were often told that it's important to practice hojo undo with the intent of improving techniques and kata. In this sense, chiishi and its focus on upper body and breathing seem to compliment sanchin kata well - which is probably why we would frequently begin sanchin training in this way. For those that are interested in the chiishi kata, there's an excellent series of instructional pics (with the Japanese) on Sensei Helmut Leitner's website. There's also a good black and white YouTube video of Higaonna Sensei with a section on the chiishi kata (3:24-6:35). And, if you're interested in some of the other applications and variations I've included a video of Alessandro Sensei demonstrating some advanced chiishi techniques in the honbu dojo. While Sensei would never begrudge anyone entry, the clogs serve as a subtle ‘Do Not Disturb’ sign suggesting that you might be better returning later. Sometimes this can be a tricky affair. Some days I caught myself making up to 5 or 6 trips and been left wondering if Sensei’s not wondering around somewhere barefoot. Two hours later Sensei was still practicing a chu-dan (middle) block. Ok, so maybe I was a little misleading with the title, but there you have it. Might not have been the secret technique you were hoping for, but sometimes Sensei’s best secrets are the most obvious. In martial arts we spend a lot of our time trying to make the body fast however, self defence also requires training the senses. Sensei would sometimes tell us stories of his early training years and nights where they'd practice kakie, bunkai and randori outside in the darkness. This kind of training would be used to sharpen their vision, hearing and kinesthetic awareness and later when he moved to Tokyo he'd try to 'catch' writing or images from speeding trains. Apparently, Chojun Miyagi was always seeking to improve his vision and hearing in these ways. He'd train the muscles in his eye by looking out at sea and then focusing on objects at close distances, and in the morning when his wife would open the bedroom door he'd try and work out which of his senses (sound or sight) perceived the change fastest. In class Sensei would sometimes point to a line of the Kempo Hakku "Me wa shiho o miru wa yosu - The eyes must not miss even the slightest change". He'd explain that in self defence scenarios, the eyes must 'quickly catch' all the details of a new scene or environment – drunk, rowdy or suspicious people, exits, potential weapons and other dangers etc. In training it'd also be important to 'soften' the eyes so as to also take in the surrounds and make use of peripheral vision – a point also made by Musashi in his Book of Five Rings:“In using the eyes, do so in a large and encompassing way. There is observation and there is seeing. The eye of observation is strong. The eye of seeing is weak. To see the faraway as nearby, and the nearby as faraway is essential to the martial arts. To know your opponent’s sword, yet not to “see” it at all is very important in the martial arts. You should make great effort in this.” (Miyamoto Musashi, 1645, p.67). Just wanted to share a little home remedy recipe for black eyes courtesy of Kuramoto-Sensei. Hard boil one large egg (or two if you've had an exceptionally bad night). Apply rounded end directly to eye for several minutes. Consider ways not to get punched in the face in the future. Eat. 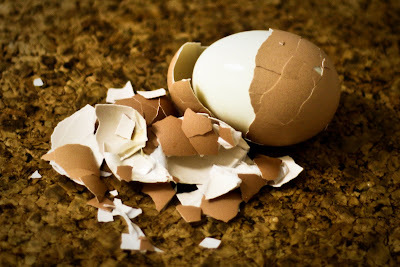 Why waste a good egg? Dojo Kun - Lost in Translation? Most people are familiar with the dojo kun – the ethics or guiding principals for students of traditional dojos. Within IOGKF, the English version of the dojo kun (below) are pretty well known and some clubs even recite them at the end of each class. But, when I first heard Higaonna Sensei read out the Japanese version one night, I was surprised by how much longer it seemed and I couldn’t help wondering if a little something hadn’t been lost in translation. Sensei was kind enough to let me make a photocopy (pictured above) and in my rather limited Japanese I’ve tried to come up with a bit of a translation. (I would however, love any input if there are some native Japanese speakers out there). Strive to cultivate a courageous, unyielding and indomitable spirit. The Japanese certainly is a mouthful but there is something nice about the original version. Karate Kenkyu Club (circa 1926). Left to right: Tokunori Senaha, Keiyo Madambashi, (two unknown), Chojun Miyagi, Seko Higa, (unknown), Seiko Kina. A lot of people have asked me about training since I’ve been back so I thought I’d write a little about traditional training in the honbu dojo. Generally speaking our sessions would follow a predictable and consistent format most nights. We’d begin with the same sequence of junbi undo (preliminary warm-ups) and usually move on to hojo undo (traditional supplementary training) and/or kihon (basics) or kihon ido (basics with movement). There is a strong emphasis on hojo undo and basics in Sensei’s classes and we’d often alternate between the two on a nightly basis. The second half of class would often be spent on sanchin or other kata and we'd sometimes be given individual corrections and then sent to practice on our own. 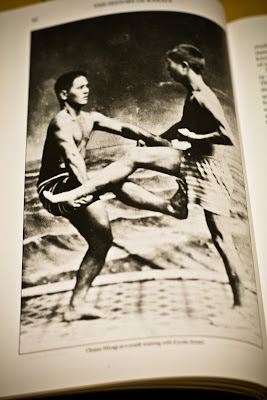 When we'd have time we'd also do some tanren (conditioning), sparring, bunkai (applications) or kakie waza (pushing hands and free techniques), and a few of us would stay back after class to do some extra junbi undo or to work on problem techniques. 1) Repetition of basic techniques (when done well) makes for solid foundations and whole body conditioning. If practiced daily these techniques become ingrained and help form the basis of the “goju-ryu” body. 2) The same routines become habit forming and teach students how to train on their own. By minimising indecision and gaps due to “thinking” or “decision time” between activities, it becomes easy to work through entire sequences of techniques, drills and corrections in individual training. 3) Daily repetition of the same basic techniques also teaches discipline and etiquette and makes for good “spirit” training. When we’re not learning anything ‘new’, even more concentration is required to stay present, focused and to continue working on improving each rep.
At times progress can seem slow when repetition is one of your main teachers, but personally I’ve gotten a lot out of this traditional approach to training. If nothing else, it’s really taught me how to be more disciplined in my independent sessions – an important lesson for someone who’s easily distracted and would often end up just working on the "fun stuff". The problem there being, the stuff we enjoy is usually the stuff we’re best at and the things that actually need the least work. Obviously it’s still important to have time to research, explore and play and some might argue that there isn’t enough of this in traditional training. I’m sure there are drawbacks to this approach too as there are with any system but I’d be interested in hearing people’s views on the topic. How does traditional training compare to more modern, progressive methods? Well I've finally settled back into life in Canberra and my knuckles have almost completely recovered from my last makawara session at the honbu dojo – a final stubborn senkai (thousand punch effort). I've been kinda torn when it comes to makawara training - I love the feel of it. And I'm not being masochistic. I'm just talking about the feedback it gives me on power, speed and technique. I like that I can spend a full hour on the makawara and still be working on improving my punch. There's also something almost meditative about those long sessions... But, as a female I'm still kind of attached to the idea of having nice hands. Calluses might be little badges of honour for most karate-ka but for us gels, scabs and band-aids really aren't such a great look. Outside the dojo I'd sometimes be told "makawara – girls no" when people caught sight of my hands. And maybe they're right, though the comment would usually make me want to head straight to the dojo for another session. As a rule, I've stayed away from ishi-hand pounding, Sensei's rock and the smudges on the walls, but this last year has still taken its toll. I know I should probably back off for a bit but I'm not quite ready to give up on my favourite wooden training partner. And despite what people say, it's just not the same with gloves. 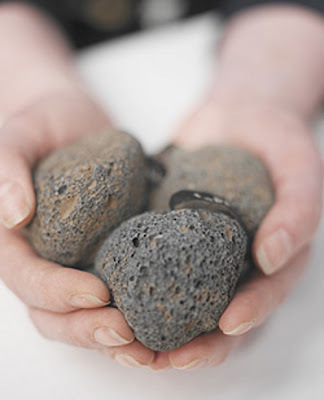 I guess I'm hoping that in time these hands of mine will return to normal or I'll be able to pumice them back to life. But, in the meantime if anyone has any pearls for reviving or preventing uglie man-hands, please share. For Higaonna Sensei, getting up at 5am to get to zazen meditation is just part of his weekly routine. Over the years he has become close friends with Grand Master, Roshi Sogen Sakiyama – the head monk at Naha’s Kozenji temple. The two of them share a love of traditional karate and have had such engaging conversations on the topic, Sensei explains that at times he’s been left sitting in seiza for up to 2 to 3 hours straight. He explains that zen meditation offers the perfect balance for martial arts students – quiet, internal training of the mind to compliment the hard, physical training of the body – yet another beautiful metaphor for go and ju. Perhaps this is why most regular zazen students (who aren’t monks), are martial artists from one style or another - “Like a zazen karate club” Sensei jokes. Zen and the preservation of traditional karate are clearly topics close to Sensei’s heart. While sports karate has its merits, Goju-Ryu is primarily about traditional training and a commitment to upholding the techniques, etiquette and ideals of karate as it was originally taught back in the days of Kanyro Higaonna and Chojun Miyagi’s garden dojos. Today, while certificates, competition and tournaments are good goals for students in training (especially when they start out), the pursuit of traditional karate requires that one’s motives progress beyond these things. In sports karate, students often retire young. 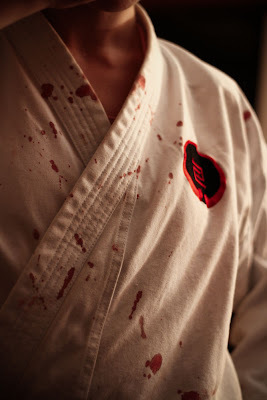 Traditional martial arts by contrast are a life-long pursuit and you can continuing training until the day you die. “Some karate masters” says Sensei, “come back as ghosts and keep training”. In karate this kind of practice is referred to as keiko 稽古. Unlike the Japanese word for practice in other sports (練習 Renshuu), the characters for keiko carry a slightly different meaning. Kei 稽 (to think or consider) and ko/furui 古 (old or ancient) also carry a meaning of tradition and respect (tracing or considering the old) – the practice and study of ancient teaching through transference from teacher to student. For me, traditional karate is also about training with an open mind, humble attitude, eagerness to learn, and determination to always do your best. Through it we learn self-discipline, modesty and respect for others. But perhaps most importantly, we learn a little about ourselves. While some of you may be happy to leave ‘mastery of the mind’ to the monks, it’s still worth remembering that the idea of zen in martial arts doesn’t have to be something mystical. On the contrary, it may just be simplicity itself that best defines it – simple, hard training for training’s sake. Learning to push our bodies and our spirits through exhaustion, pain and even boredom in the hope we might grow a little as human beings. The Japanese Zen Master Taisen Deshimaru frequently wrote about the principals of Zen and Bushido noting that for the monk and the warrior there was no difference between the two. In the West, there’s a tendency to often think of karate simply as a fitness or self-defense thing. When in reality, we might not even realize the deeper meaning behind much of what we do - the short meditation (moksoi) at the beginning and end of each class; the emphasis on tanden and breathing; whole body awareness, concentration and ‘presentness’ at every moment; zanshin; even the use of pain as a tool for increasing focus, overcoming ego and learning humility and respect. Perhaps even the simple pursuit of self-improvement – the constant striving to better ourselves physically, mentally, and spiritually. In any case, the next time you catch yourself going through the motions, it's worth being mindful of the significance of these actions. This is the 'stuff' traditional martial arts are made of. 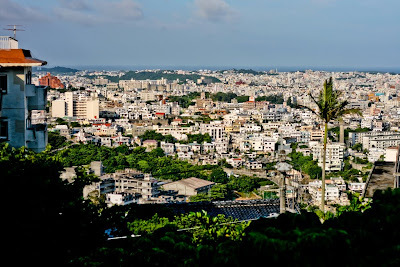 View of Naha from the Wall of Shuri Castle near Kozenji Temple. I think my next biggest challenge will be maintaining my independent training when I return home. I can’t honestly say whether I’ve technically improved all that much in my time here. But, if training at the honbu dojo has changed me in any way, I think it’s really taught me how to improve myself. I've learnt a little about how to train by myself – how to make the most of my time and the importance of focused training when it comes to those weak, badly behaved body parts and awkward techniques. It certainly helps to have a good series of junbi undo, kihon and hojo undo sets to work through. I think in my next series of posts I’d like to look at these in more detail. For now, I think I’ll end this entry with a short clip of an Okinawan folk song I’ve had stuck in my head all day. It’s called Shima Uta (島唄, Island Song) and it’s hard to go anywhere in Naha without hearing it playing in stores, cafes and izakayas. To be honest, I wasn’t a huge fan of traditional Okinawan folk music at first, but like a lot of things here it’s really grown on me. The original version of this song was actually composed by a Japanese band (The Boom), inspired by stories of Okinawan survivors of World War II. The video clip below isn't great but I do think Rimi Natsukawa does a nice version of the song. Maybe it’s just the melancholy tone of the music but today at least it certainly seems to reflect my current mood. * There's also a good English rendition of the song here. It’s 1.00am here and I just got back from a little stroll around the city but it’ll probably still take another hour or so before my mind fully winds down for the night. For some reason, since I've been living here I've been unable to get to sleep on the right side of the clock. It's strange coming from someone who's generally able to sleep through anything (university lectures included). Though it seems like I’m not the only one to have problems sleeping. For most members of the honbu dojo getting to bed before 1am is generally considered an early night – an impressive effort given that everyone has day jobs. It has got me wondering though what's causing the insomnia? heat? training adrenalin? late meals? coffee addiction? In my last post I talked about some of the Okinawan secrets to long life – well I’m starting to think that sleep might not be one of them. I’d always thought it'd be pretty important for good health. And yet, everyone here seems to be up late and no one's complaining so long as they get their daily dose of caffeine. Sensei’s no exception. He trains late but is regularly up at dawn for zazen at Kozenji temple. And I have to say, for me at least, going to bed in the AM, and getting up at 5 is not an easy task. 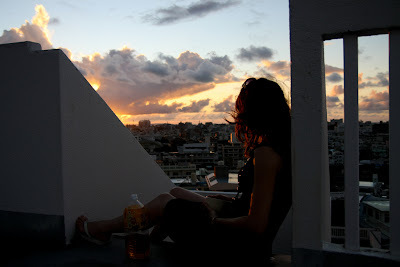 It is an interesting time though in Naha. If the city ever ‘dozed’, I think it’d be in these early hours. By 5 most people are finally snoozing even if it’s in a drunken stupor on the curb. The roads are quite and it’s maybe the only time you can hear the birds. Even the red light district is empty – the crates outside the various ‘snack’ and hostess bars even seem almost lonely without their usual nightly occupants. The strange hours here certainly take a little getting used to. And while I look forward to a sound night sleep without the aid of eye-masks and earplugs, these are all things I know I’m going to miss when we return home. Something that’s happening much sooner than I’d like. But enough talking, my brain’s finally stopper whirring and I think it’s time for bed. I’m often told that we “must prepare for our old age now”. By Okinawan standards, that means most of us have got a fair bit of work to do because here, you don’t qualify as ‘old’ until you're at least approaching triple digits. Okinawas have long been famous for their ability to seemingly defy the aging process. They have among the longest life expectancies in the world but they don’t just live longer than the rest of us, they live better. Even with the highest ratio of centenarians (34.7 centenarians for every 100,000 inhabitants), Okinawans have among the lowest levels of coronary heart disease and stroke; osteoporosis, cancer and dementia. And for the most part, they live active and vibrant lives right to the very end. A little while ago Sensei told us about an Okinawan friend of his; a 104-year-old man who has been practicing karate for most of his life. When Sensei asked him his secret to longevity and good health he answered “vegetables, chess, sanchin”. To this day he still plays Go (Japanese Chess) and practices sanchin kata in Yogi Koen – a local park not far from the Honbu dojo. 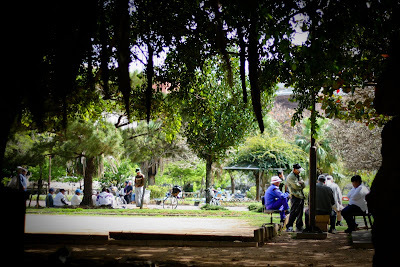 And, while to most Westerners, it might seem strange to see a park that’s usually devoid of children and full to the brim with old men; it’s really nothing out of the ordinary here – in a city where it’s common to see people in their 70s, 80s and 90s cycling around on bicycles, working, gardening, jogging, and stretching at the traffic lights. So, what are their secrets? 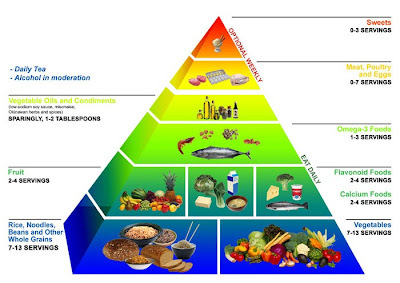 Well it seems that a key factor is DIET – a balanced low calorie diet, rich in low GI, complex carbohydrates, seafood and sea veggies, omega oils, fruit and lots of veg as well as other natural herbs, spices and high-fiber foods like beans, legumes, sweet potato, whole grains and konnyaku. They also eat twice as much fish as the Japanese, five times as much veg as the average Westerner and more kombu, kelp and tofu than anyone else in the world. And while I must confess to picking out all the bitter green stuff first time I tried goya champuru, somewhere along the lines my body must have had words with my taste-buds because these days I find myself eating it almost every day and sometimes even craving the stuff after training. But maybe it’s not just about what the Okinawans eat, but what they don't. Until recently at least, the traditional Okinawan diet has consisted of nutrient rich, unprocessed whole foods – fresh, organic, home-grown produce that you can buy daily at the local markets. And in addition to avoiding preservatives and additives, their traditional diet is also very low in sugar and salt (approx 1/4 the average amount consumed in Japan). Okinawans also have a saying, “hara hachi bu”, which means 'eat until your to 80% full'. Maybe easier said than done, but given that it takes 10-20 minutes for our stomachs to signal we’ve had enough, leaving a little space at the end of a meal is a good rule of thumb to prevent overeating. 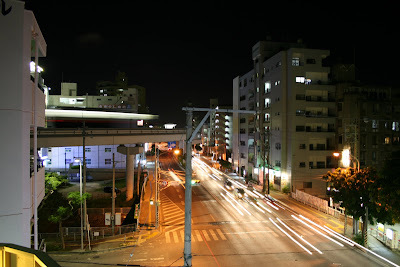 In addition to diet, their other secrets may be related to the way Okinawans live - a LIFE STYLE that's fulfilling, connected and reasonably stress-free. 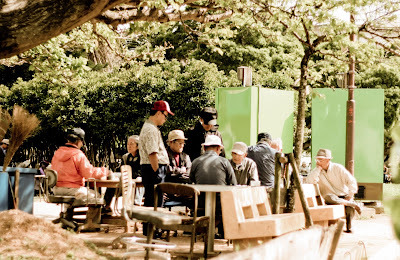 Despite being one of the poorest prefectures of Japan, Okinawans are generally well know for their friendly nature, optimistic attitude and laid-back way of living. The locals here often talk about 'Okinawan time' which seems to tick by much slower than life on the mainland or in the West for that matter. Sometimes they'll even refer to themselves as lazy (and maybe blame the heat), but their positive and carefree attitudes might just be one of their best kept secrets. Beyond that, staying ACTIVE is clearly something the Okinawan oldies have down pat. Perhaps that's where as the birth-place of karate, the many traditional martial arts available here have the advantage of being something one can practice (as many do) right into their wrinkly years. There really is something reassuring in knowing that our martial arts training might just be preparing us for that ongoing fight against old age. Every now and again Sensei tests us with one of those hard and unexpected sweat sessions. Tonight was one of those nights. After an hour of warm-ups and hojo undo, Sensei told us that we’d be doing some traditional hard basics - in memory of An’ichi Miyagi Sensei. According to Okinawan funeral customs, after a person dies their spirit remains in a kind of purgatory on earth for 49 days until it passes into the spirit world. Sensei explained that An’ichi Miyagi Sensei’s spirit would remain with us until the 15th and until that time we’d be doing traditional hard training in his honour. In other words, if you’ve got enough energy to stand, you’ve got enough energy to train. And, until you’ve collapsed in a heap on the floor or passed out from exhaustion, it's only your head that's holding you back. Easier said than done, I know. I’ve never wanted to pass out so badly. But at the end of the day these are the ‘golden sessions’ – the ones you remember. And, they're only as valuable as you make them. Saturday nights at the honbu dojo have recently been made nights for individual training. Classes usually start at the regular time but we’re pretty much left to our own devices – an opportunity to work on corrections and play with things we learnt during the week, maybe even do a little partnered free sparring, bunkai, or kakie waza. Sometimes on these nights when I’m striking away on the makawara or working on kata, the sounds seem to come together in an almost musical way. The rhythmic pounding of someone’s hand against a rock, the whirring of a skipping rope, the sharp exhalations of someone doing chiishi, or the thud of combinations against the heavy bag. I can’t help but smile to myself as we all huff, puff and sweat in the silence. It reminds me of a scene from Zatoichi. I’ve included the clip below. I think it’s interesting that Sensei has decided to change things up in this way. One could say this kind of indepenent training more closely resembles the traditional Okinawan approach. But, whatever Sensei’s motives, I’ve come to really like our independent Saturday night sessions. They’ve been a good test of our ability to remember the junbi undo, kihon and hojo undo routines as well as a real lesson in focused training and self-motivation. But enough talking, it's time for some training. 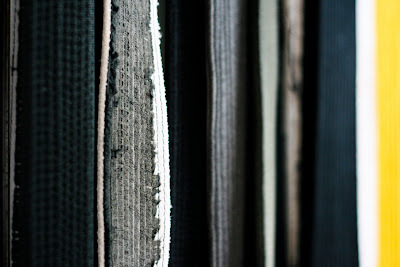 When I first visited the honbu dojo I was quite surprised at the almost shabby state of Sensei’s floor – a real patchwork quilt of potholes and duc tape. Bruised, cracked and bandaged, I remember thinking that it reminded me of an aged and beaten opponent. And, with all its war wounds I’d sometimes wonder what stories it might have to tell. I’ve heard about visitors to the honbu dojo who have intentionally tried to put a foot through Sensei’s floor. 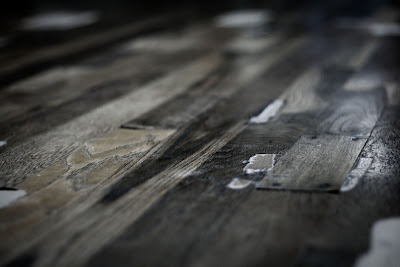 I don’t know if I can believe such stories, but accidents do happen, and the dojo floor has seen its fair share of them. To look at it, it’s certainly not what you’d expect from a world famous dojo. But thinking about it, it couldn’t be a more fitting home for traditional karate – humility and simplicity. Armed with little more than hammers and chisels, the students of the honbu dojo today tried to resusitate the old wooden floor before Sensei returns from his travels abroad. And, I have to say; carpentry is harder work than it looks. The job’s not done yet but it’s getting their slowly and I think everyone is looking forward to the feeling of smooth timber under our feet. Part of me does wonder though if Sensei won’t miss his little boobie traps – tape that constantly trips and tests us challenging our suriashi. In class the famous words “don’t lift your heels” seems to be regularly followed by the sound of stumbling. And, while Sensei knowingly glides around the floor like on ice, for the rest of us, there’s nothing like gummy patches of tape to challenge one’s ability to stick, without getting stuck. On Tuesday April 28th An’ichi Miyagi Sensei passed away. The funeral was held on Thursday afternoon and was a beautiful service. In the funeral hall, a glowing photograph of An’ichi Miyagi Sensei stood in front of a large wooden replica of a Buddhist temple. In front of the temple a sea of white and yellow flowers spiraled and flowed from Sensei’s portrait. To the left and right, the walls were adorned with large bouquets of flowers sent from around the world and condolence messages painted in kanji on tall wooden plaques. We humbly paid our respects and met briefly with Higaonna Sensei afterwards. He was in good spirits smiling as usual and reminded us to continue to do our best in training – perhaps the best way to honour the memory of his teacher. “I owe a great debt to many people of the development of my karate skills but I am most grateful to An’ichi Miyagi. Not only did he teach me the true techniques of Goju-Ryu karate, but he passed down to me an entire history and tradition that otherwise may have been lost forever. He also instilled in me strong moral standards and a desire to acquire knowledge. He taught me that one should always seek humility and that the stronger one becomes the more humble one should be. He likened this to a stalk of rice, which bends lower as it grows taller. Human beings are to do likewise, he said. An’ichi Miyagi leads a simple life as his teacher did. In both his life and his training, he remains loyal to the teachings of Chojun Miyagi” (Higaonna Sensei, 2001, p. 155). I remember Sensei telling us once that in traditional karate it is important to always remain humble – that we must always strive to improve our martial art and ourselves in this way. Some martial arts masters he said, train until they die and then return as ghosts to continue their training. If such stories are true, I suspect that An’ichi Miyagi Sensei would be among these great karateka. Lately before training I've taken to spending 10-15 minutes watching YouTube videos of Sensei’s kata. Maybe a little obsessive of me I know, but in my defense my mini movie nights started mainly as a way of switching my brain from work/study mode into the 'zone' for training. I remember coming across some interesting research a while back about the brain and motor learning. In short, the researchers found that by simply watching someone perform an action with the intention of mimicking them, we can activate neural pathways in the brain actually responsible for performing the behavior. Who would have thought you could actually improve your kata – or any technique for that matter – just by sitting at your desk? I know there's no substitute for actual practice but it's good to know that on nights where you really can't make it, you may be able to trick that brain of yours into training without training. I think my kata at least, has changed slightly since I’ve been doing this – a small shift in timing and focus if nothing else. If anything, the whole experience has got me thinking a little about the power of praise – something until now I've certainly taken for granted. If you think about it, praise really has to be one of the most fundamental human desires. The desire for status, wealth, fame and success all seem to have this common denominator – the goal of achieving recognition and respect from others. I've heard some people say that we’re currently living in an overpraised generation where too much of the wrong kind of praise may actually be a bad thing. I recently read an interesting piece of research that found when children are praised for their efforts they are more likely to choose harder tests, are more resilient to failure and setbacks, and on later tests, their marks improve. By contrast, children praised for their intelligence or natural ability, chose easier tests when given the option, are distressed by failure and actually show declines in later tests of academic performance. It seems as though praising effort gives people a variable they can control which in turn makes setbacks and criticism more constructive, less frightening things. In the context of training, it’s safe to say that honest and sincere encouragement goes a long way. For me, there are really few things more motivating than the words "getting better" grunted approvingly from Sensei. And, while praise beyond this is seldom directed at seniors, to the awkward and self-conscious beginner, a good sensei seems to find potential and strength even more readily than he/she finds fault. It’s amazing to see what such simple words can do. And maybe it shouldn't just be up to seniors and teachers to praise their students. I remember how in awe of my seniors I was when I started training (and still am) – though I never dared tell them so. And yet, they probably battle with their inner critics as much as the rest of us. I wonder why praise is such a hard thing to give when it's something we all like to receive? We certainly do have to be careful with how and whom we choose to praise. Have you been affected by praise? I'd love to hear your stories. Update: I just came across an excellent article on American Traditional on the topic of praising one's superiors (or rather not). It's worth a read. On the whole, I’ve received a lot of really positive feedback about Memoirs of a Grasshopper. But last night I received a particularly damning anonymous comment. The knowledge there is even one person out there who feels this way is enough to cause me to stop and question what I’m doing. In the spirit of openness – which is part of the reason I started this blog – I’d like to respond and hear other people’s views. “Krista, I have read several of your blogs and cannot believe that you have the audacity to analyze and comment on your superiors as if they are your "friends". They are your teachers and mentors. You are there to learn from them; not pal around with them and write like you interviewed them for a 2 hour documentary that was broadcast on prime time tv. You write in your blogs like you are the only woman to have ever performed karate/martial arts or accomplish the things that are so ordinary. Granted, the things that you've done are good, but nothing that has been done before or that will be done after you. In the world of martial arts and karate, there is a such a thing as humility and trying to improve oneself. Write to loved ones about about your experiences, but "Memoirs of a Grasshopper" blogs is an insult to the true idea and meaning of the karate/martial arts mindset.” Anonymous. Firstly, I have to agree there is nothing special about what I’m doing. I’ve been here less than a year, am barely a nidan, and obviously very junior in the honbu dojo. I am certainly not the first female to be doing this either. In fact, the current apartment I’m living in used to be occupied by a young woman who was a very strong and senior member of the Honbu dojo and one who’s far more accomplished than myself. When I leave, I have no doubt there will be many more after me too. Memoirs of a Grasshopper has, for me, been first and foremost a personal journal and way of reflecting on my own experiences. The things I’m doing are certainly not out of the ordinary. However, I believe that each person has something unique to offer from his or her own perspective. Writing has opened my eyes to martial arts in way I never knew and has really enriched my time here studying Goju-Ryu. While my situation isn’t special, I do believe it’s a lucky one – and one that many people don’t get the opportunity to experience. I’ve loved being able to share this with others while also learning from those more experienced than myself. I currently follow a number of martial arts blogs and believe this sharing is part of the wonder if the Internet. Perhaps the commenter assumes that by publishing online, the material is prefaced by some ‘claim of importance’ or ‘specialness’. People can blog about anything (and do!) – it’s part of what makes it so great. Perhaps my greatest concern with the above comment is the suggestion that in making my posts public I have been in some way disrespectful of my superiors. I have nothing but absolute reverence and admiration for my seniors both in the honbu dojo, and within wider Goju Ryu and martial arts circles. Maybe it’s wrong of me to feel this way, but since moving to Naha I’ve come to consider many members of the Honbu dojo close friends. We often joke around outside of training and I feel lucky to know such amazing people who inspire me to always do my best. Higaonna Sensei and others have encouraged me to write but I’ve always asked approval before using their names, comments, illustrations etc. That said, if the frank and open way I have described them or our trainings has given offence, I sincerely apologise. The very last thing I ever wanted was to trivialise how important these people are to me and how much I value their teachings. 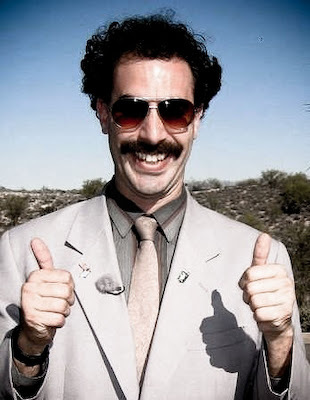 Well, I passed my grading. The honbu crew also did the dojo proud and I felt privileged to be able to grade with them. And, as you can see, while I didn’t get away completely unscathed, if I hadn’t come home with a few bruises or a bit of blood I’d have probably been disappointed – little masochistic of me I know. 2. Keep those hands up especially if you find yourself sparring a 4th-Dan. I suppose beyond that, the pain-numbing power of adrenalin has once again come through and surprised me in the end. Seems like the morning after every grading I wake to embark on a little treasure hunt of discovery - small sprains, cuts and lumps that I could swear weren’t there the night before. If anything it makes you realize that in a real life scenario even if you land one of your strongest punches square in the face of your opponent, this may not be enough to slow them down - which is why it’s important to never stop and to always have a backup plan. Then again, on the flip side, it’s also nice to know that in the thick of it, even if you’re on the receiving end of one of those punches you can end up surprising yourself too. Ok. So we all talk to ourselves. Some of you might be thinking, “talk to myself? I don’t talk to myself. Do I talk to myself?” It’s ok. We all do it. 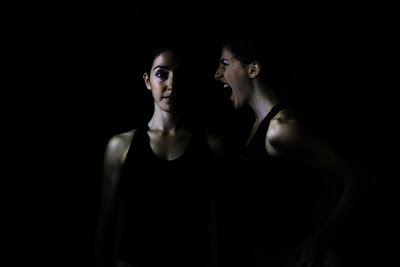 As a martial artist I often find myself sparring with my inner critic. Sometimes we have a little light randori – she helps me identify my weaknesses and occasionally I surprise her with a few techniques. Other nights however, I get an absolute battering. I come away bloody, bruised and generally unenthused about returning to training. With the grading only a few days away, these full contact kumite nights are becoming more common. And, while I know she thinks this kind of sparring is helpful, there’s only so much pummeling a girl can take. By all means, a little self-criticism is healthy. It helps us improve and keeps our ego in check. But be warned. A good sparring partner corrects and encourages. They’re not negative, judgmental or mean. Members of the dojo come and go but your internal training partner is one you’re stuck with for life. You may as well try and befriend them. They have the potential to be your best teacher or your most malicious opponent. And, on days when it’s just the two of you, this training buddy may just make or break your sessions. “Trust in yourself. I can. I cannot… no. Always, I can, I can”. Simple advice. Like many of Sensei’s pearls this one really rings true for me - something I'm going to try and remember next time I catch myself getting a beating. What do you make of your inner doppelganger? Are they a friend? Or a foe? * Click here for Español. I have to admit; on occasion in sparring I’ve been guilty of throwing my limbs in the general direction of my partner’s head or torso in hope that I’ll hit something that hurts. Sometimes I even end up aiming for the less vulnerable areas so I can afford to hit them harder. While we do have to look after our partners in kumete, this kind of ‘lazy’ sparring can develop bad habits. I don’t care how strong you are, if your punch lands square in your opponent’s pec or bicep, you’ll really need to start thinking about what to do next. 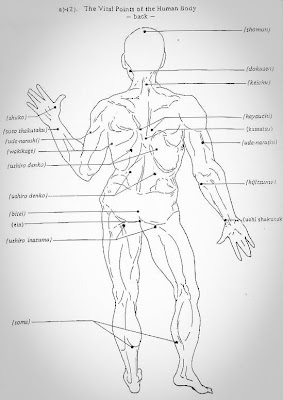 With the grading approaching I’ve found myself having to re-learn the Japanese pressure points (kyushu) that’d I’d once memorized for my shodan exam. It’s amazing how quickly one forgets these things. In any case, it’s reminded me of the importance of having a clear intent with our targets and to occasionally explore spots you might not always think about striking. One of the things I love about traditional karate is training to attack these more vulnerable areas – the spots usually off limits in competitive martial arts. Groin strikes, chokes and eye gouging, biting, ripping at ears and pulling hair (sigh) – all that good stuff – these are the things self-defense is made of. In training Sensei frequently encourages us to poke and prod ourselves and our partners to develop a feel for those hard to find places. Something tells me he could find them all blindfolded, but I’ve learned not to ask twice about the exact location of pressure points unless you’re after some first hand experience to ‘burn’ those spots into memory. In my last post I talked about the ills of belt systems. Sensei recently asked me to sit for a grading and I’d be lying if I said part of me didn’t get a little excited. In truth, I'd love some more time. But, I do feel incredibly privileged to have been asked to grade under Sensei. It’s an amazing opportunity and one I know I just can't turn down. So, while it’s easy to sit here and claim that grades aren’t important, it’s obvious that there’s still something in it. Perhaps it’s not so much the dan-grade but the grading process that makes it special. For me, gradings have always been something very different to competition or competitive sport. In my teens I raced nationally in triathlon and cross-country running but these events never really compared to the physical and mental ordeal of our gradings. And, while puking and being pummeled isn’t everyone’s idea of a fun time, there really is ‘something’ in being booted right out of your comfort zone and pushed to your absolute limits. I remember having the odd experience once amid countless repetitions of push-ups at the end of a grading where for a brief moment, the pain disappeared, my head cleared, and everything became effortless. Unfortunately it didn’t last long. But, I felt that for a brief moment at least, I had clarity. Maybe it was just the endorphins. But then, it’s always possible I caught a small glimpse of what some might call ‘satori’ – a ‘little awakening’, one of those brief moments of enlightenment you occasionally hear talked about in training. Whatever it was, I’ve always felt that the physical, emotional and spiritual trial of gradings has forced me to grow as a person (if only in growing my pain threshold). And through them, I’ve come to learn a little about myself that I didn’t know. In the end, pass or fail, the mere fact I survived and gave it everything is I think what makes it special. Recently I heard a friend say, “it’s up to you how hard you push yourself”. Very true. I suppose the next stage is to learn how to give everything in normal training. Gradings are great challenges but maybe the greater challenge is fighting the urge to tune out and go through the motions. Imagine how much we’d improve if we treated all trainings like gradings. I still remember the first night I turned up at training in a crisp new karate gi. The thick canvas felt so bunchy and uncomfortable and my stiff new white belt stuck out at odd angles like a badly behaved bowtie. It was as if my new outfit was insistent on making me look as stupid and awkward in training as I felt. It’s funny looking back on things now. Belts and grades have since come to mean a lot less to me. These days there seems to be such an obsession with qualifications and ranks. With McDojos popping up everywhere, it seems like every man and his dog has a black belt. 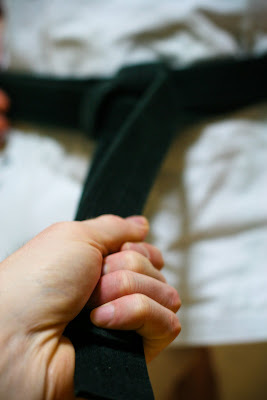 Now the latest craze seems to be accumulating black belts in as many styles as possible – qualifications worn like little badges of honour on martial arts CVs. The irony here is that black belt is really just the beginning. A sign that you've mastered the basics and you're ready to start your real training. Back in the days of Chojun Miyagi’s garden dojo no one wore belts. In fact, everyone just trained in their underwear. Apparently coloured belts weren’t introduced into martial arts until judo adopted them and Chojun Miyagi was always against them. 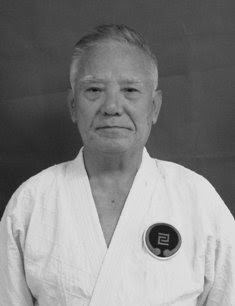 Higaonna-Sensei told us he was graded to sandan (3rd dan) at his first grading in December 1960, but even then he rarely wore his belt. At the end of the day, I think if a belt has any value it’s really only determined by the difficultly required in earning it. I know that when I finally was awarded my black belt, I was still so intimidated by my seniors it took me a few months before I really felt comfortable wearing it. While progressing through various grades can be a good goal for students (especially beginners), maintaining a high club standard is I think the best motivator. Instructors who rush their students through the grading process really aren’t doing them or their club any favours. I suppose it’s really worth questioning whether the benefits associated with this system are worth it? “I agree that for students they are a way of measuring progress but at a high price. They cause discontent, squabbles, and lead to excessive pride in self, which is the opposite of what martial arts training, should develop in a student. Every one has different standards so, inevitably there are differences between the level of students from different dojos even when they have the same grade, and then the politics start. I believe that there should be black belts and white belts only, and that the focus should be on training, not on accumulating rank." (Morio Higaonna Sensei, Dragon-Times, Issue 10). Maybe we’d all benefit from going back to the basics. Should we lose the belts and train in our knickers like in the good ol’ days? These days, traditional karate doesn’t often make it into the movies. I suppose our simplistic style of fighting doesn’t compare that favourably to our more 'impressive looking' Kung Fu cousins. Add to that the whole principal of ‘ending a fight immediately’ and I guess you haven’t got much material for long action-packed fight scenes. A little while ago I did see a flick however that managed to make realistic traditional karate work on screen. The film’s called Kuro Obi (Black Belt). Like all good martial arts movies, the plot’s a little melodramatic in parts but the fight scenes are pretty great. Simple. Realistic. And, I think pretty true of traditional karate. It really comes as no surprise that two of the main characters Akihito Yagi (who plays Giryu) and Tatsuya Naka (who plays Taikan) and are 5th and 6th dan karate instructors. As an interesting side note, Sensei Yagi (pictured above) is President of the International Meibukan Gojyu Ryu Karate Association and actually teaches at a dojo in Naha’s Kume district (barely 10 minutes away by bike). The martial arts world really is a small place. In any case, I've included a few clips from one of the earlier fight scenes below and short video with some behind-the-scenes footage. If you haven’t seen it, it’s worth a peak – especially for anyone interested in traditional karate, what it looks like, and how it differs from other more cinematic styles of fighting. After all, there’s nothing like a good martial arts movie to get you fired up for some training. “Tanden wa (king), ashi (legs/feet) wa soldiers. King tells soldiers – Go!" What I like most about this analogy is that it captures the subtle difference between initiating movement from the tanden and over exaggerated ‘leading with the hips’ – maybe a bit like a King charging out ahead of his army. In this sense, the tanden shouldn’t so much move before the body, as with it, while giving the orders. By pulling slightly on my belt, Yamashiro Sensei showed me how to initiate movements without the obvious weight shift involved in stepping. This enabled me to slide forward more easily without telegraphing my movements by keeping my head and upper body aligned and still. Replicating the movement without Sensei’s help is another matter – it’s much harder pulling yourself around by your own belt! But, so far the imagery has proved useful in training and hopefully with enough practice King Koshi will get better at commanding the troops. What is this mysterious ‘tanden’ we so frequently hear about in martial arts? 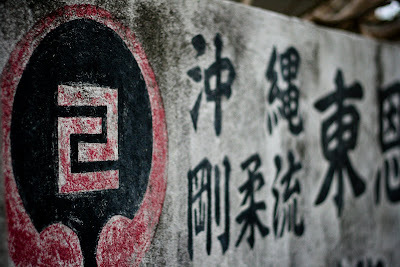 丹 – tan, ‘rust coloured’ or ‘red’ and 田 – den ‘rice paddy’ or ‘field’. Together tanden (丹田) literally translates as ‘red field’ or ‘burning place of fire/energy’. Sometimes Sensei refers to kikai (気海) tanden where the characters of ki 気 ‘spirit’ and kai or umi 海 ‘ocean’ describe the tanden as the body’s ‘sea of energy’. 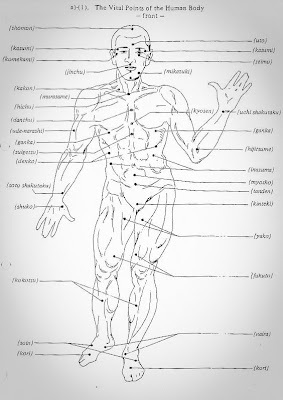 To say that the tanden is important in martial arts would be a pretty big understatement. In Eastern traditions, the tanden (or dantian in Chinese) has for a long time been considered the physical centre of gravity in the human body and the source of all internal power, energy or chi. The point is believed to be about the size of a grapefruit and is located three finger widths below and two finger widths behind the belly button. 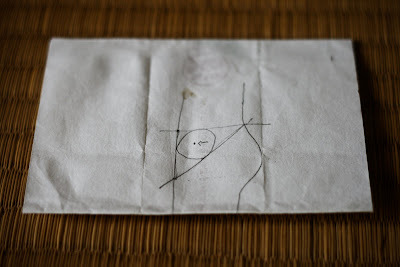 Above is a small diagram of the tanden drawn by Chief Instructor and Chairman, Yamashiro-Sensei on a piece of paper one night when were discussing internal power over dinner. 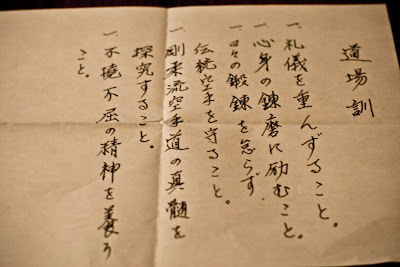 My tanden was near full of awamori at this point but I remember Yamashiro-Sensei delicately folding up the paper as if it contained a marvelous secret and I decided to keep it. In many traditional Japanese arts – shakuhachi (Japanese flute), shodo (calligraphy), kyudo (archery), kendo (swordsmanship) and even chado (tea ceremony) – students are taught to act from the tanden. This area also serves as a focus point in Taoist and Buddhist philosophy and Zen meditation and is believed to help center one’s mind and aid in controlling thoughts and emotions. “When power comes from the koshi (the core of the body), it is much harder to anticipate a movement... When you pull back your right arm, the odds are that you are going to throw a right punch (or some other right handed technique). When you "squeeze" or "twist" your koshi, a movement could come from anywhere” (Goodin, 2009). Whether it’s using dropping or winding power, or pulsing from the feet, it's worth concentrating on pivoting and moving from the tanden. I think overall this focus may help to generate power while giving stillness, silencing the body, and improving overall efficiency of movement.